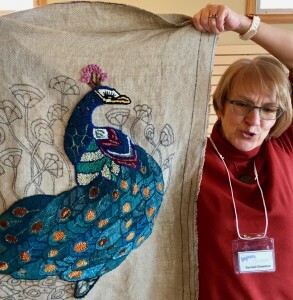 SOFAAR is pleased to be offering, for a third year, its Fabulous Fall Fibre Retreat. This event will take place the weekend of September 27th to 29th 2019 at the beautiful and historic Hillsdale House Inn. Although this year’s programme has yet to been finalized, we can promise you lots of time to work on your projects in a quiet environment – the retreat is limited to 30 attendees -, a lovely meal on Saturday evening at the Inn, two receptions and a popular attendees show and tell! Four rooms of the 15 available have already been booked for this event, so don’t hesitate to come and join us! There is even an early-bird Thursday night room rate. 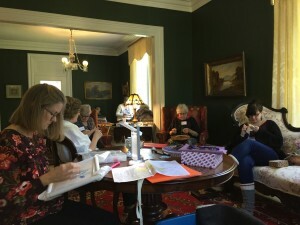 2018 Retreat attendees busy at their fibre projects. 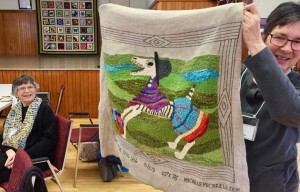 We had a wonderful show and tell at our Saturday Snips in Digby on February 9th. This “new to us” venue was light-filled and a great place to work on projects. Our next Saturday Snips will be on Saturday, March 9th at Saint Luke’s Parish Hall in Annapolis following our quick AGM beginning at 1 pm. 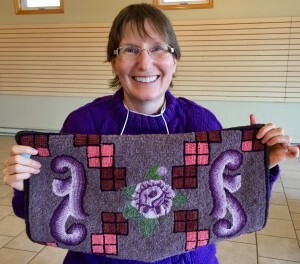 Linda showing off her very first hooked piece! Congrats on such beautiful work! Rachael, Grace and Cathy working away. Rachael’s stunning peacock in progress. 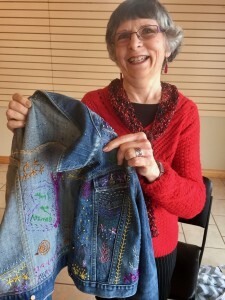 Grace is continuing to embroider on her jean jacket. 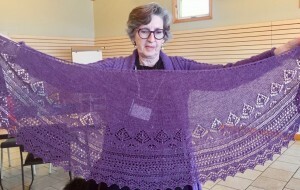 Lynn’s gorgeous knitted shawl. We all wanted it! 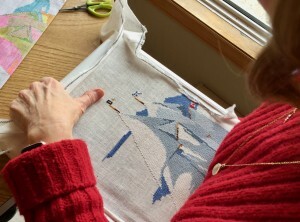 Ann Marie’s Bluenose cross stitch taking shape. Christine’s embellished hooked Prince symbol in progress. Our February 9th Saturday Snips gathering will take place at the Digby Heritage Centre at 7 Birch Street from 1 to 4. We love seeing members come out with some show and tell and a project to work on. SOFAAR looks forward to seeing you. Our March gathering will also be our Annual General Meeting and it will take place on Saturday, March 9th in Annapolis Royal. Day of the Dead Dog hooking in progress. 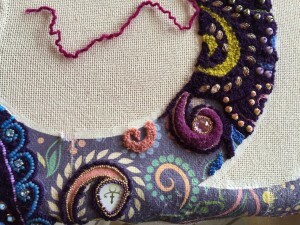 Snips and Scraps: lots of fibre fun! 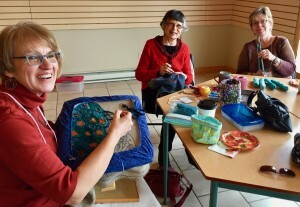 ONE room left for the Fabulous Fall Fibre Retreat!